Hotel investors play coy with a reference to a “W-type hotel,” but considering Starwood Capital’s history we know it will be another high-quality property that sees a multi-million dollar investment. The developers of 701 Seventh Ave. in Manhattan’s Times Square expect to have an agreement with a hotel company in the next 45 days that may pave the way for a new tower, one of the site’s owners said. Witkoff and partners Vector Group Ltd. (VGR) and Winthrop Realty Trust (FUR) announced last week they had bought the property, located on the northeast corner of Seventh Avenue and West 47th Street in one of New York’s most popular tourist areas. 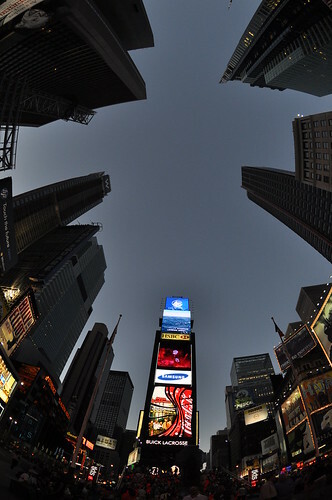 There are over 175 hotels in Times Square and still there’s room for one more. Photo by Ludovic Bertron. “If we produce a hotel brand on top and get anywhere close to the leasing on this down below, the deal’s a screamer,” Witkoff said. “We’ll look a lot smarter than we probably are.” The owners want a “W-type” name for the site, said Steven Witkoff, referring to Starwood Hotels & Resorts Worldwide Inc. (HOT)’s boutique brand.